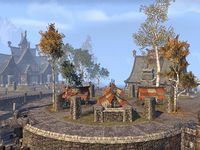 The Riften Marketplace is a trading plaza in Riften, which houses a collection of various stalls. Vendors' tents are situated around a well in the central part of the city. Tana-Teeus and Ethad-sa can be found aside from the others, at the eastern wall of Artisan's Hall, the city's smithy. A blacksmithing station can be found beside Gjudusil. There can be two safeboxes in the market, one is behind Boran and another one is behind J'darzi. Cambio's tent contains a desk and a bookshelf. All items scattered around the market, including leveled pieces of armor and weaponry and loose soul gems, as well as all the storage containers, are owned. The Arcane Stop — A stall owned by the mystic Cambio Gestor. Boran's Bulwarks — An armorer stall run by Boran. A Fresh Start — A stall owned by the grocer Ethad-sa. J'darzi's Fine Imports — A general goods stall owned by J'darzi. Leatherwear By Gjudusil — A leatherworker stall run by Gjudusil. Neckbender's — A stall owned by the woodworker Euthar Neckbender. Something Sharp — A weaponsmith stall run by Deowyn. Tana-Teeus' Fine Satchels — A stall owned by the pack merchant Tana-Teeus. Tolfari, Tailor — A tailor stall run by Tolfari.